Sitting on my desk is this lovely 1950s Smiths De Luxe folding alarm clock. 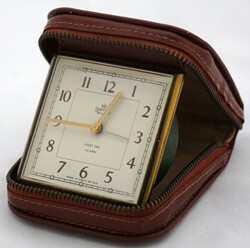 The Smiths De Luxe range were Smiths' best clocks and watches in the 1950s. Sir Edmund Hilary wore a Smiths De Luxe watch when he climbed Everest. This folding alarm clock has a square face which has an Art Deco feel. Art Deco dates from the 1920s and 1930s, but many firms still made products with this styling in the early 1950s. The clock has a zipper case case. It is not real leather as leather was a luxury in the years after the Second World War. This helps to date the clock to the early 1950s. Later clocks had folding metal cases. Clock makers covered the better ones with real leather or pig skin. As this was a high end product, it has an eight-day movement. So you only needed to wind it up once a week. Luxury folding clocks had this feature. These clocks were expensive and usually bought as gifts for someone special. In the 1958 Harrods Christmas catalogue is a Smiths eight-day travelling alarm clock for £4 17s 6d. In today's money that's £75. This clock was a luxury and Smiths clocks do have a following with collectors. But it is still only worth around £20.